All Black lock Steven Luatua is a humble young man. The 25-year-old professional player is amongst the most sought after rugby players on the planet and will soon head to the United Kingdom for a lucrative contract there. He is in Samoa this week with teammate, Jerome Kaino, to promote the upcoming Super Rugby fixture at Apia Park between the Auckland Blues and the Queensland Reds, Luatua took a journey down memory lane where it all started. And that journey he told the Samoa Observer yesterday truly began here in Samoa. The man from Malie and Sale’imoa first tasted international rugby with the Samoa’s U20’s programme. During an exclusive interview with the Samoa Observer, Luatua recounted his journey from humble beginnings where he shared a room with four other teammates to staying villas and five star hotels with the All Blacks. “We didn’t have much,” he said. “Back then it was five guys to one room and some of us sleeping on the floor. “Our training wasn’t on a marked outfield, per say, it was just on a massive plot of land and we just did laps. The tough times made the 25-year-old into a better person and a better player. He said he learnt to appreciate his blessings. “Seeing how things are run on this side of island, seeing how much more heart it takes to get through and what the Samoan boys get through, I think it was an eye opener,” he said. If there is one thing his time with Samoan rugby taught him, it was respect. “If I had it my way, I’d send all the kids back from New Zealand to Samoa to experience it,” he said. Fast forward to today, Luatua said he is grateful for the chances that have come his way – including the privilege to play for the world’s best rugby team, the All Blacks. He understands the challenges Samoan rugby is experiencing but he is optimistic, saying he believes Samoan rugby is heading the right direction. “I know Samoa is doing great things,” he said. Reaching the highest echelons of rugby, Luatua uses his humble upbringing to stay grounded. “I’m always grateful to come back here,” he said. “I spent a year here as a kid. I got sent back when I was younger not because I was naughty but I wanted to come back. Luatua was visited last year for a family reunion. “It was my mom’s side of the family and it was great. “I got to see my grandparents and spend some time here. 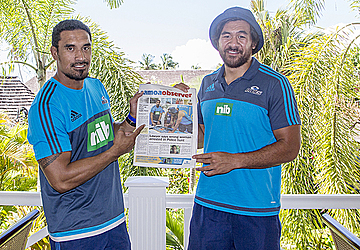 Luatua and Kaino have been in the country to promote the upcoming clash between the Blues and the Reds. The Auckland lock/flanker said he is looking forward to the challenge and he is keen to run out onto Apia Park before his people. As for the Blues form of late, he said they have lost a few games due to small things but he is confident they are not far away. He hopes they will find their form in time to give all the Blues fans in Samoa something to cheer about come Friday 2 June 2017.